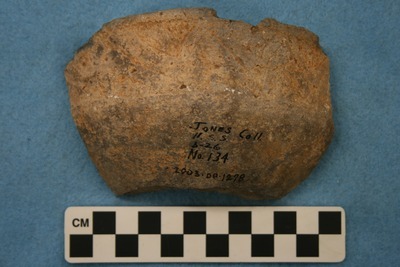 "41UR315, Burial 26, Vessel 134" by Timothy K. Perttula and Robert Z. Selden Jr.
DECORATION (INCLUDING MOTIF AND ELEMENTS WHEN APPARENT): The rim panel has an engraved nested triangle motif repeated five times around the vessel. Each lower nested triangle—with apexes pointing towards the rim—has three sets of triangles, while the upper nested triangles (apexes pointing toward the vessel carination) have two sets of engraved triangles. Ripley Engraved, var. Williams carinated bowl, Vessel 134, Burial 26.